The Xbox One X console is officially set for launch on November 7, 2017. 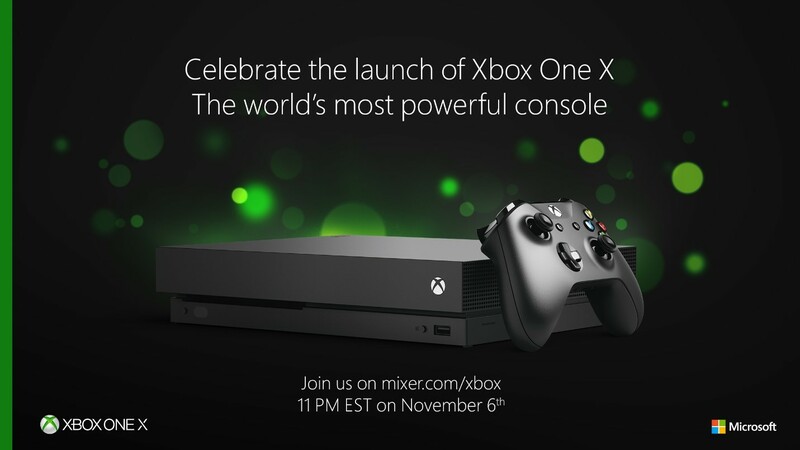 On November 6, Microsoft will be live broadcasting the one hour unveiling event from Mixer NYC Studio at its flagship store in New York at 8 PM Pacific time. The event can be watched from the mixer app on Android and iOS, the Xbox channel on Twitch, the Xbox YouTube channel, or Facebook Live. For those in New York City, Microsoft will be giving away a Samsung QLED 4K TV and some Xbox gear at the event. Pre-ordering the Xbox One X will allow consumers to pick up their console from a Microsoft store at 9 PM Pacific time immediately after the launch event. Approximately 600 Best Buy locations will also be able to distribute consoles following the event, as well as giveaways. Microsoft says that the Xbox One X is the "world’s most powerful console" to date, but that really is not much to go off. The Xbox One X is available now for pre-order and will cost you $499.99. Full specifications of the console are unavailable until the launch event takes place.